How will we feed our billions? 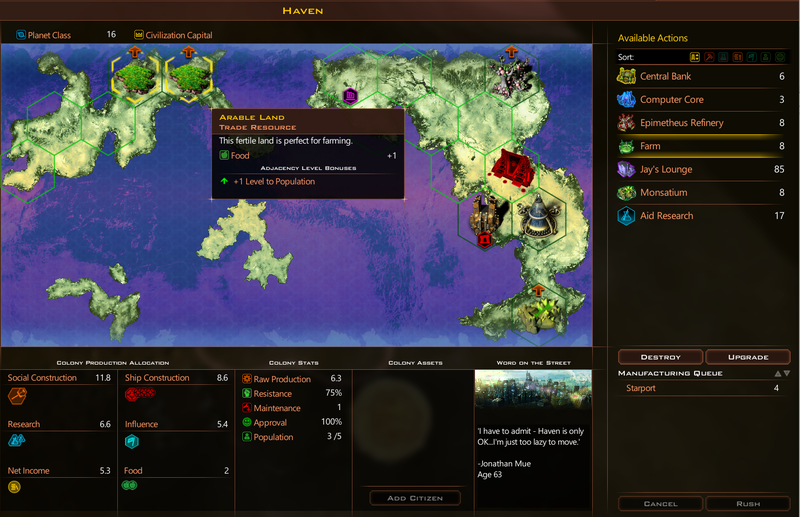 In Galactic Civilizations III, we presume that by the time we are colonizing planets, our home world has reached an equilibrium between food production and population. But let's face it: when we colonize other planets, it'll take many years for those planets to build up sufficient farming infrastructure to produce for the kinds of populations you have on your home world. Galactic Civilizations III will be treating food a bit differently to reflect the awareness of just how important a large population is on your planets. When Galactic Civilizations III first shipped, players built farms on planets and that would increase that planet's population. Because it was so easy to increase your population, our conversion between population to production was: production = the square root of population. When Galactic Civilizations III v2.0 came out, we changed this so that food became a global resource that was then consumed by cities. You could build as many farms as you wanted elsewhere, and then build cities on another planet that used that food. Because this made increasing population more challenging (requiring two tiles -- a farming tile and a city tile), the formula was changed to production = population. This proved better on paper than in practice because on larger maps, players had no problem dedicating entire worlds just to farming, no matter how terrible the planet or how unrealistic that would be. This worked well for building other planets to huge populations, but it created production quantities that were balance breaking. Throughout the v2.x series, we have tinkered with the formulas for what it takes to build a farm and what it takes to build a city, to the point where players were becoming frustrated when they discovered they didn't have the right resource to build something. For v3.0, we have created a much simpler - and we think, more intuitive - system. Good planets have arable land tiles. The better the planet, the more of these tiles it will have. You can choose to build farms on them or you can bulldoze them and build whatever you want. This reflects the fact that Ceti Alpha V (a class 6 world) is never going to have farms while even a wonderful planet like Earth (class 10) can't have its entire surface farmed (and we do abstract farming to an extent in that your initial colony is self-sufficient in food). Thus, population = production. Arable land produces food without you having to do anything at all, but you can also build them up with various levels of farms and use that surplus food elsewhere. Some worlds will have no arable land. Others will have several. In this example, my home planet starts with 2 arable tiles, which produces 2 food right away. Now, unlike other resources, unused food doesn't accumulate. As my wife regularly reminds me, food spoils and I should stop eating it when it does. But it does mean that with a few good early planets, you can start building cities on planets without having to have built a single farm. It's proving to be a really interesting mechanic. There are two good planets here. One with 3 food tiles and one with 1 food tile and an elerium deposit. Which one should I colonize first? In the above example, getting the Elerium deposit means I can instantly build enhanced lasers, which have military significance. But if I settle the other planet, I can build a city on my home planet immediately. This creates some interesting strategic choices that simply did not exist before. Galactic Civilizations III v3.0 is due for release in April. - How many food units does a city need? - Will there be tiered cities? - Can farms now only be built as upgrade to the arable land tiles? - Will there be (much more expensive) greenhouse buildings to cultivate some food on planets without arable tiles? - What happens when food surplus becomes negative (e. g. by invading an enemy planet with a city but without food)? Can you terriform tiles by arable land tiles so upgrades and adjacency and special buildings can be used. I like how this mechanic sounds. Is there still going to be a monsotium roadblock in the farming improvements' upgrades? As suggested before, monsotium-contingent alternatives with greater benefits than improvements that do not require that resource would be prefferable. Excellent, truly excellent re-assessment of this mechanic. Bravo! Apparently you have chosen to stick with the middle ages peasants scenario. How sad. Vertical greenhouses with plants that do not touch a single grain of sand is todays tech already. Concern: I play maps with low planet density. I've had more than a few games where one resource is completely absent. This system would mean there is exactly X amount of food in the galaxy. How do I know I won't get several hours into the game and discover there's only enough food for one city total? Or less? Wait, Triple_Crown, so arable land's very LOLable but "1.5 billion citizens" on your transport isn't? Okay, "arable land" is probably a bad choice of words, but the concept's sensible. Does silicon life actually need durantium? Seems like they eat nothing at all. Making food production somewhat automatic seems to lessen some of the "I''m going to die because there's no (resource name) in my galaxy" issues some on here have had. On the other hand, I guess if you know your opponent needs a certain resource to make food improvements and you've got that resource, it's a way of beating them down/helping along their demise, so I get the strategic attraction of food improvements needing durantium/something else to work. Wouldn't it be simpler to have those "Arable lands" Triple_Crown loves so much produce food at x level which makes population to a certain level and once the population reaches that level, a particular farming improvement becomes available? Do away with needing resources (that might be incredibly rare) entirely. If farms can only be built on that arable land and you've colonized a non-arable land planet, you can obviously destroy it. But of course, it might have other uses ie be a Research +50% planet so why would you want to do that, so at that point a certain amount of surplus food goes to that planet to support it's growing population. Have an "Allocate Surplus Food" screen or just add something to the planet list screen that has a tick box for selecting which planets get that surplus and how much. Basically: make early stage population work just the same for every species/race. It only differentiates once the first farming improvements become available and you get Farmer Citizens and any race traits relating to bubba-making/food production come to the fore. Arable Land is a good addition but should be one of several food production options available. Grain Plants such as Wheat are not reasonable for use with Hydroponic Systems or Vertical Farming due the massive amount of space needed. This is where arable land fits in perfectly. Perhaps some of the land could include a food production bonus for eatable creatures, like beef or dairy cattle on Earth. There is bound to be some alien creature eatable and tasty on a far distant planet. Oceans should be stockable with fish for a + food bonus. A Fishery could do this. Add a Fishing Tile on land adjacent to Ocean where a Fishery could be built or the resource destroyed if you would rather have a different improvement. Vegetables and Fruit are perfect for hydroponic or vertical farming, the option should be given to build for a lesser food output than arable land either on the world or as a starbase module. Feeding your Empire should not be dependent on any single food type. There should be multiple options available for exploitation. Just as there are multiple weapon types available to exterminate your enemies, there should be multiple food types developable to feed your people. This will help avoid the situation where scant food negatively affects the gaming experience. Yet still available to exploit strategically. I would think the little small bonus hex inside a tile would be the better way to go for food over a resource tile, so a player or conquering CIV could change their mind on its use. This is game about setting up a galactic empire, not a science-fiction version of Farmville 2! The detail is impressive, PalaceGuardian, but it's going to get in the way of getting a victory in the game because it lends itself to more micro-managing (do I grow vegetables or fruit on this spot? Fruit. What fruit, bananas or peaches? etc etc). Food needs to be as basic as possible for everybody because, let's face it, frogboy's right when he says it's tedious at present. Automatic food production, for those of us who go on about realism, immersion yada yada, is realistic because when you colonize a planet, of course that Colony Ship's going to have food resources on it. Maybe the 1 billion LOL citizens (morbid obesity obviously isn't in GalCiv3, another break from how life is now, either that or your Colony Ship is several kms long) who fit on that Ship were in Cryo-Sleep so that's how they survived the journey but now they're on the planet it's back to food consumption. It makes more sense to me to make food assuming winter crops producable twice a year than a one time thing on farms. I mean farms produce food every year unless you use winter crops which is twice a year. Storage would still need to last six months. Maybe the year could be decided on a random basis on how long it takes the planet to go around the sun. Just saying different planets have different day, and year lengths. What would this mechanic actually add? Realism is only of value when it improves the game play. This isn't Banished. I don't want to have to plan for winter, especially winter on dozens of planets with different seasons! R.I.P. wild grain. With its +3 on and +1 adjacent population bonus it was always a good spot for a city with a more than self sustaining ring of farms. I think you're ALL missing the point. Did you notice that we're currently on version 2.8 and they're going to 3.0? Personally, I think we need to put this on the TV series Ancient Aliens and bring this up as a conspiracy theory. ver, 2.9 is in the same place as Windows 9. What this adds is for food to act like food. Farms don't produce food only once, and done. Farms produce food yearly or twice a year. Silicon, or synthetics can mine constantly; while carbon have a one time food resource. Every argument was shot down by realism, so now i'm bringing realism farms don't produce food once, but continously every year, or twice a year. How this improves gameplay is that instead of being only once. It is now twice a year. This would be more competive against synthetics which can mine promethium every turn which does not rot. This could also be done automatically like mining, but requires a farm instead of a starbase. 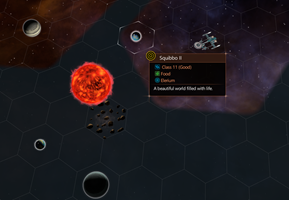 If Stardock are choosing to go to the "use it or lose it" approach with food, then admiralWillyWilber's point is bang on: If Stardock are going to keep the different "food" methods, then carbon will be at a disadvantage if it's surplus foods dies while synthetics's surplus food ie promethium just goes up and up in storage. So: either adopt the approach I advocate - all species create food the same way, ultimately. Give it different names to make it "different" if you like, but it works the same. This allows Stardock to keep the "use that food or it starts to stink real bad and get poisened" approach frogboy says they've come to and apply it to all species. Or keep carbon food as "soilable" after a certain period but give carbon farms a certain buff to compensate (and the speed at which food is produced is a good place to start). Alternatively, food production speed becomes a disadvantage if you play as carbon. Which is fine if it's one of few reasons and anyway is countered somewhat by a carbon advantage. But you don't want to have a species that has so many disadvantages that you're a fool to play as that species. The food hasn't changed in the sense some are talking. Food was always use it or lose it (you can't build an inventory). 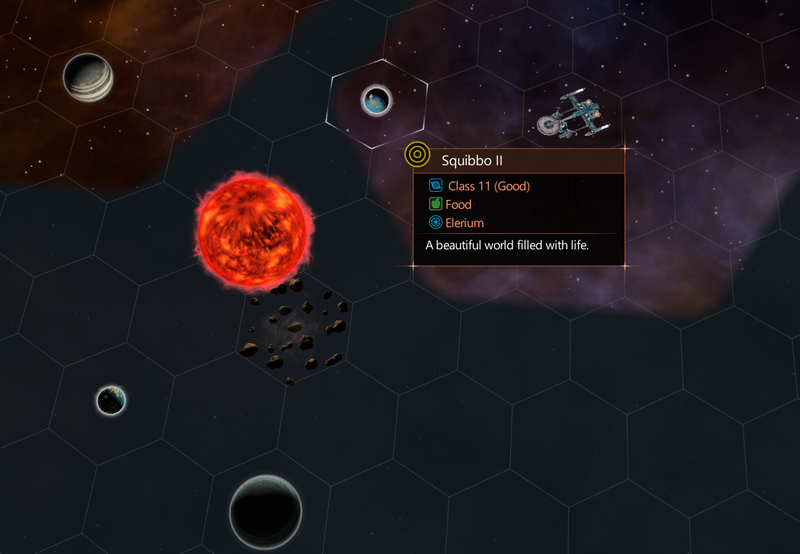 Planets now spawn with arable land tiles that give +1 food just for existing. No build up required which means you can build cities without ever building a single farm potentially. Only arable tiles can be farmed on which increases their food output. Arable tiles can be bulldozed over if you don't want them. The net result is that most players will end up being able to build more cities but you won't (realistically) be able to have hundreds of food per turn anymore by those min/maxing the system. Will the bulldozing mechanism mean that non-carbon civs can do a scorched earth policy on an advancing carbon civ eventually making it impossible for that civ to expand it's population? Might need a tech or mechanism to establish new or former arable tiles. New would destroy the balance they are making so would go for the re-establish former A tiles.